As we age, our body will start to break down in different places and on various accounts, which is not a good sign at all, although we can be thankful that advances made in the world of medicine has somewhat improved the quality of life in the golden years even when sickness and ailing health strikes. However, getting the right supplements would help a whole lot, and there are times when it can be rather difficult to remember all the various pills that you will need to consume at the right time. This is where technology comes and play its part in the form of the aptly named iRemember. How does iRemember work? For starters, it is capable of sending out notifications to your smartphone whenever you or your family member forget to take their pills. It is simple and yet smart, as it informs you (or the patient involved) of the last dose of pills taken, as well as buzzing you with a reminder of when to consume the next one. All notifications will be sent straight to your mobile device or the cap of the iRemember itself, how neat is that? 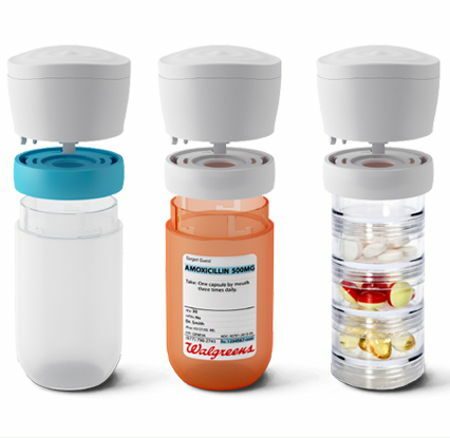 Setting up the iRemember across different sizes of pill bottles or organizers are a snap – and it will also monitor the different times of doses that are taken, so that it will alert those involved in case a particular dose is about to be missed. Apart from that, the iRemember lives up to its name, being able to tell just when the last time a dose was taken as long as one presses the top button of the device, or to access that information via a free mobile app. It requires less than 60 seconds to set the entire shebang up, and you can even select the method and how often you would like to receive such notifications. There will be future developments that will enable additional data options including a heads up before you run out of pills, or the sending of vocal messages to your family caps and FDA updates.